This is a long post, friends. Please grab yourself a comfy seat and a cup of tea. 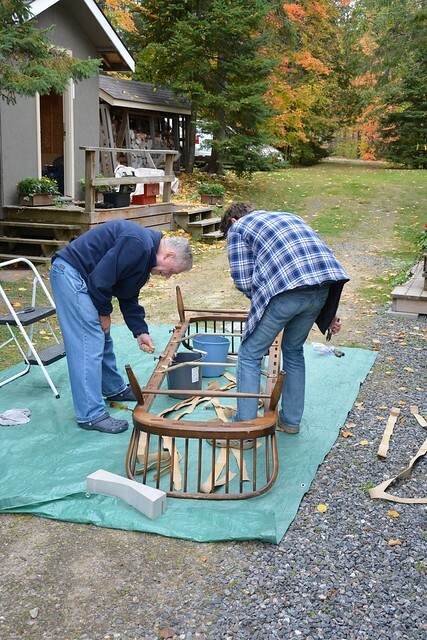 We’ve got a furniture restoration project on our hands! Just last week, my husband and I made our almost yearly trek up to visit family in Canada. This includes a stay in the wilderness known as cottage country in northern Ontario. I’ll post more about the cottage soon, but what you need to know is that one of my favourite non-nature-y activities while at the cottage is visiting antique stores and junk shops. Some of which are quite literally junk shops. Hello, Seguin Township dump store! On one of these outings, my mother-in-law Sharon drove us to a favourite shop in Parry Sound, which includes a proper furniture store in addition to barns filled with all manner of antiques, knick-knacks, and old household wares. It’s probably the stuff of nightmares for a fire marshal. We asked the shop owner for a price ($100 CDN) and where it came from (England). Then we hauled it out, checked that it was sufficiently sturdy, and decided that it was a project we could not resist. 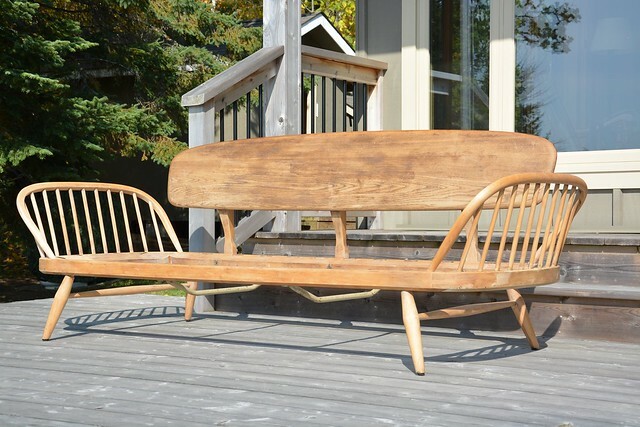 It would be perfect as a daybed under one of the big picture windows overlooking the lake at my inlaws’ cottage. Lucky them! Thanks to the wisdom of my Instagram friends, we learned that this is an Ercol sofa and indeed made in England. 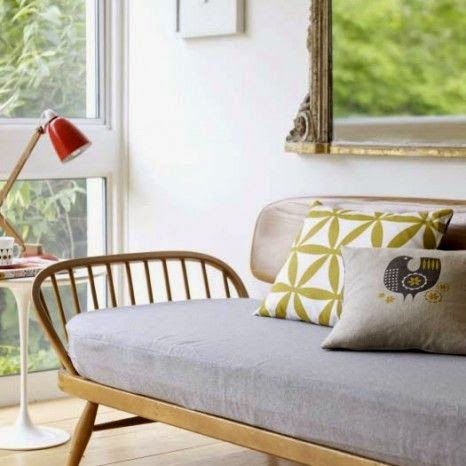 Specifically, it’s the Ercol Studio couch which was designed in the 1950s by the company’s founder, Lucian Ercolani. They’re still being produced and are rather pricey. I’m quite pleased that my eye for quality mid-century junk is in good working order! We took the sofa back to the cottage with us where I gave it a rub-down with mild soap to see what sort of condition the finish was in. The original stain is really neat. The darkened areas accent the back and the spindles of the arm rests. Sadly, it was badly damaged in a number of areas along the arms and back, so we decided to strip and refinish it completely. The plan is to achieve that nice and bright honey-toned look like the sofas above. As an aside: I think I’m really bad at vacations. After the cleaning, we removed the original webbing, which we learned is a very high-quality rubberized webbing made by Pirelli. (Sound familiar? They make tires.) 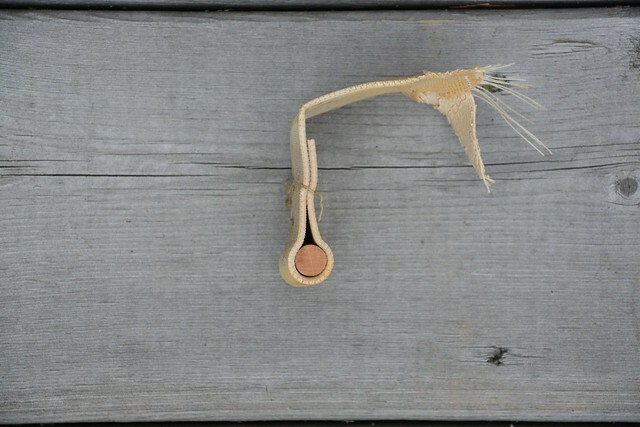 Each strap was originally held in place with wooden dowels on either end. In its previous life, someone had tightened up the webbing by cutting it shorter and stapling it on one side. We’ll try to get a whole new set of webs and dowels so it can be restored to its proper state. Our main accomplishment was stripping off the finish. Pro tip: instead of using steel wool to remove the paint stripper, we used those green scrubber pads used for washing dishes. Their main attribute is that they’re super cheap, yet effective and gentle enough to not damage wood. The best part is that you can buy an armload and just toss them out as they fill up with gunk. The stripper only went so far in the areas where the original finish was very dark, leaving some really dark stains. So I started to sand: 100-grit, followed by some ‘medium’ grit sponge, and finally 220-grit. 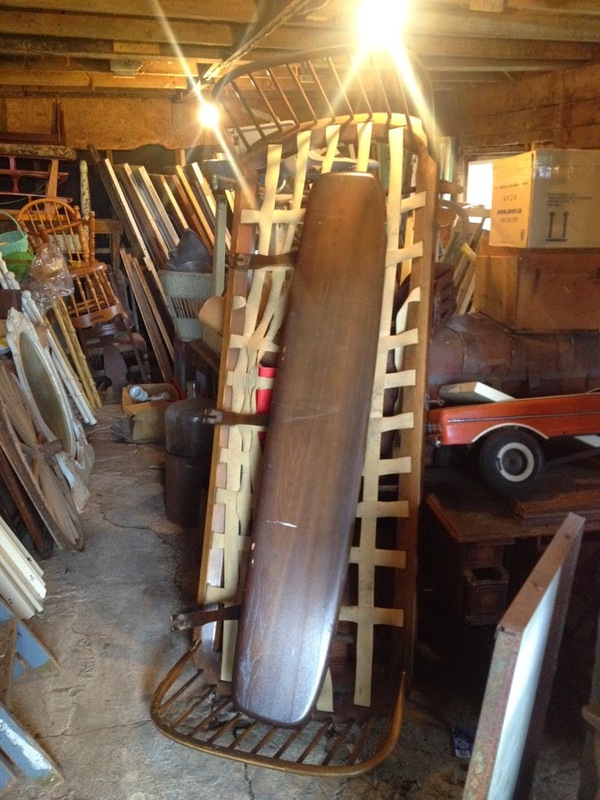 I love the grain and the surf-board shape of the back rest, but it still needs a LOT of work. 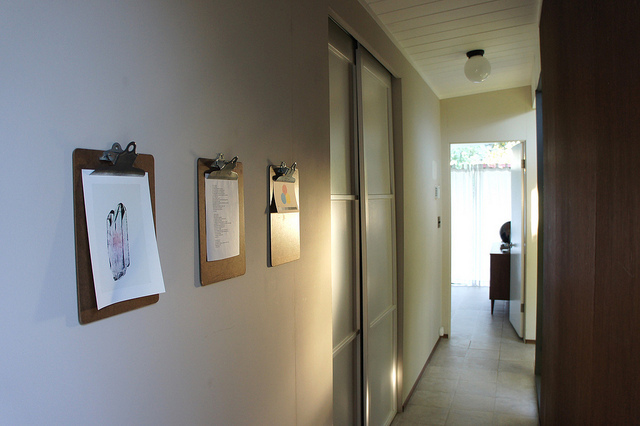 Here are a few close-ups of where I sanded. You can see the contrast between the residual stain and the bare wood. I sanded the first three spindles and half of the bottom frame (on the left) and the corresponding top of the arm rest. The wood is so nice and bright. 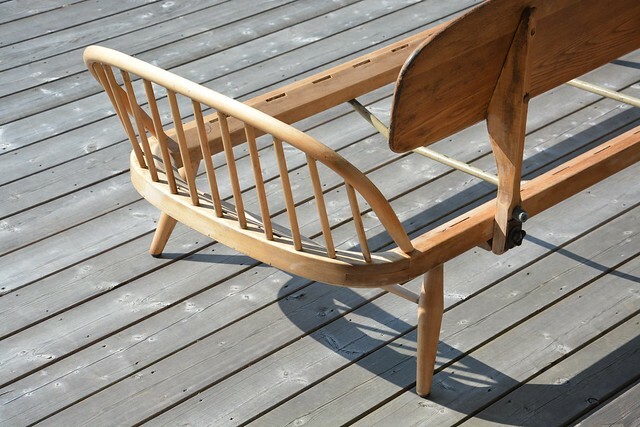 The frame is solid beech and the back is a single board of elm. And that’s as far as we got. I would have loved to have a few more weeks, even days, to work on it. 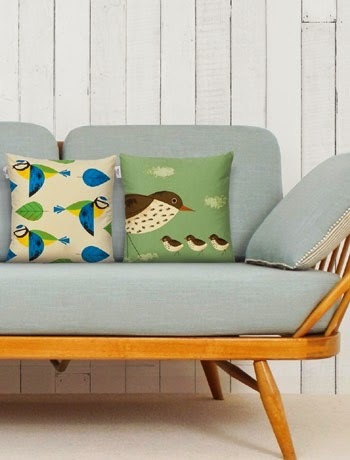 In the meantime, we’ll have to make do with looking at other Ercol sofas online, restored and styled in cute ways. Sharon and I are figuring out the webbing situation and what the seat cushion will look like, leaning toward something simple and in the neutral gray-to-greige spectrum. I can’t wait for this project to be finished. This is gonna be great! Love the lines of this sofa. Despite spending the first 90% of my life in England, I’d never seen one until now…well, until you posted on Instagram. Great job so far. Look forward to seeing how it turns out. Thanks Andy! I am seriously struggling with the desire to hop on a flight back to finish sanding that frame. 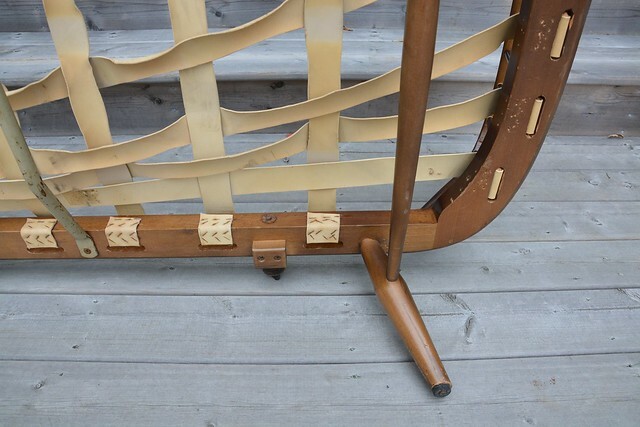 Hello, I have a chair with wooden dowels like this that I want to reweb but I can’t figure out how to get the new webbing in place with the dowel and the dowel in the holes and tighten it- I can only seem to do it on one side. 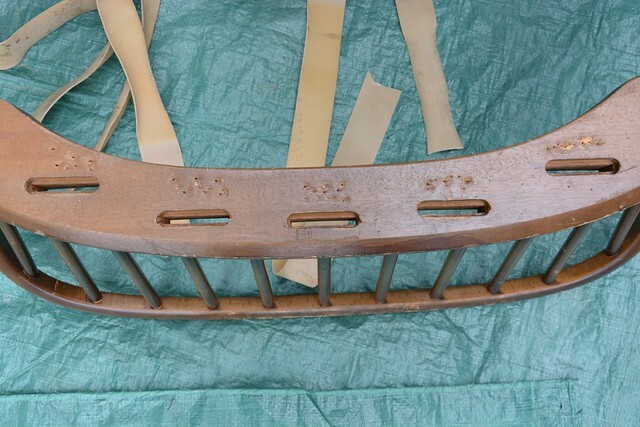 Hi Ellie– I think the key is to use the rubber webbing which is original to this type of furniture (unless you’re using that already– in any case, you can find it on ebay or on the Ercol company website). 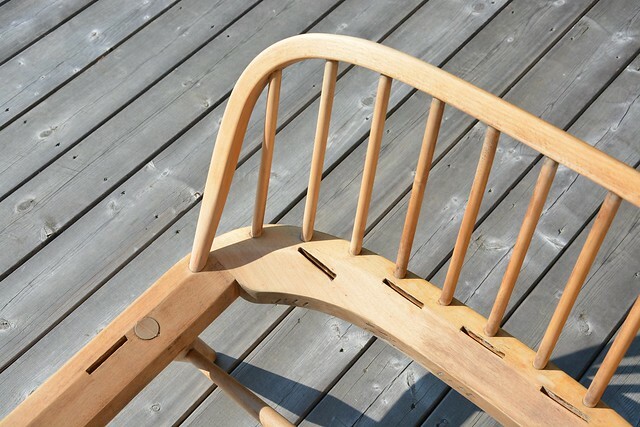 Here’s a tutorial we found quite useful, which uses big staples to create the loops for the dowels: http://www.upholsteryshop.co.uk/cms_display.php?content_id=3 My mother-in-law just re-webbed our sofa by sewing with a heavy-gauge needle to make loops instead. It takes some muscle to stretch the straps and get that second dowel in, but it’s doable… with a helper. Good luck! 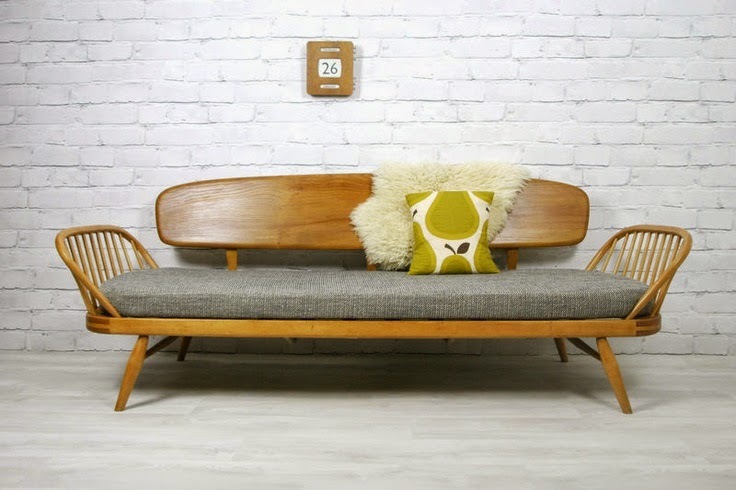 Have just purchased a mid century Ercol suit consisting of 2 seater sofa and two armchairs. 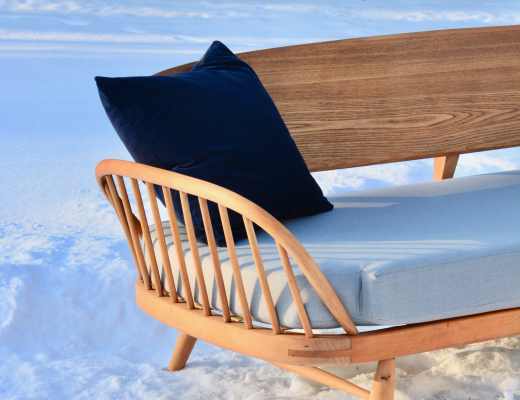 They are beautiful and are currently Ercol’s ‘golden dawn’ colour (which is the original colour of your daybed). I am awaiting delivery but cannot wait to get started on their restoration. Your pictures are great and may give me the confidence to strip my furniture back totally and go with the blonde wood look. 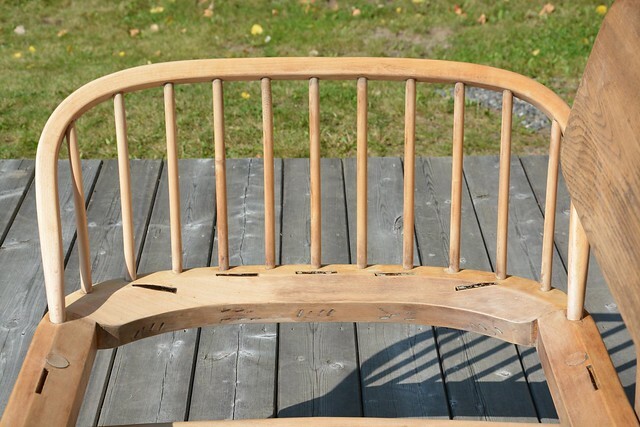 My sister has an Ercol daybed identical to yours – I must show her your pictures. How is yours coming along now? I am in Ireland, quite a bid of Ercol furniture would have been imported from England to Ireland in the 50s, 60s and 70s so bits and pieces comes up for sale on line here from time to time. Hello Aine, and thanks for stopping by! That’s very exciting that you have an entire set coming! 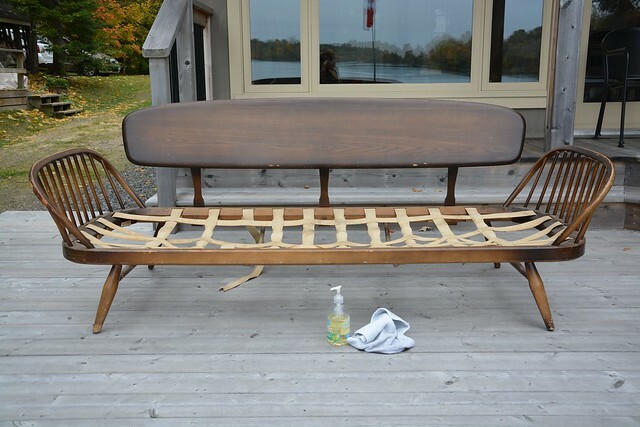 We finished sanding down the wood on our daybed this summer, and treated it to a very light stain. It turned out a bit deeper than I had hoped– I should have done a test spot on the underside! We’re getting new cushions made now at the upholsterer’s, so hopefully by the holidays it will all come together. I’ll post an update once I get a chance to style it up a bit. 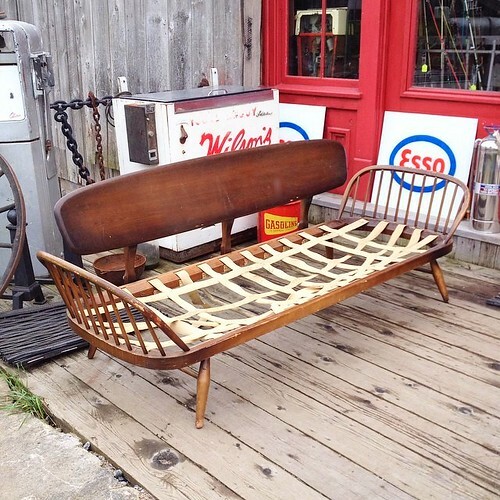 I grew up with this daybed which ,t parents brought to Toronto in the 70’s with a ton of other Errol pieces. I would love to repurpose them in our home. Thanks for the blog post.